Kizuna is uniting the Little Tokyo community by hosting an interactive and fun-filled scavenger hunt for participants college-aged and up on Saturday, Sept. 15, from 2 to 5 p.m. Starting at Higashi Honganji Buddhist Temple, 505 E. Third St. (at Central Avenue), Los Angeles, teams of four to five will set off on a quest that will take them in and around Little Tokyo. 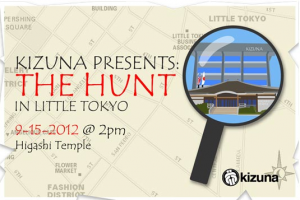 The Hunt will explore dozens of landmarks and local businesses as well as tap into the rich history of the Little Tokyo community through clues and challenges that will provide a unique and engaging experience for everyone involved. There will be prizes, including $500 for the first-place team. Visit www.kizuna-la.org to learn more about the event and register online. You don’t have to have a full team to register now; you can send the remaining team members’ names later.